Firefox is an open source web browser from the Mozilla Foundation, a non-profit organization utilizing thousands of volunteer programmers from around the world. It is an open, customizable browser, supporting the most up-to-date web standards and a wide range of open source formats. Web browsers, such as Firefox, provide a user access to the internet through a graphical user interface (GUI). Firefox is available for Windows, Mac, and Linux operating systems (OS). Menu choices and the browser’s GUI will differ from one OS to another, but its use and options are applicable to all operating systems. To get a FREE download of the latest version of Firefox browser for your system, please visit http://www.mozilla.com. As you can see from the image below, Firefox has many of the same components users are accustomed to seeing in their everyday applications. The “file menu”, highlighted in red, provides access to common menu options such as file control (File), text editing (Edit), and help content (Help). Additional menus also provide access to view controls (View), browsing history and bookmarked pages (History and Bookmarks), and more advanced tools (Tools) to customize your browser. The “toolbar”, highlighted in blue, contains navigation buttons (forward, back, reload, etc. ), a location bar, and a customizable search bar. These items are right at your fingertips from the start, letting you jump into browsing without a lengthy configuration process. Of course, a wide range of customizations are available for those interested, some of which will be covered in later sections. 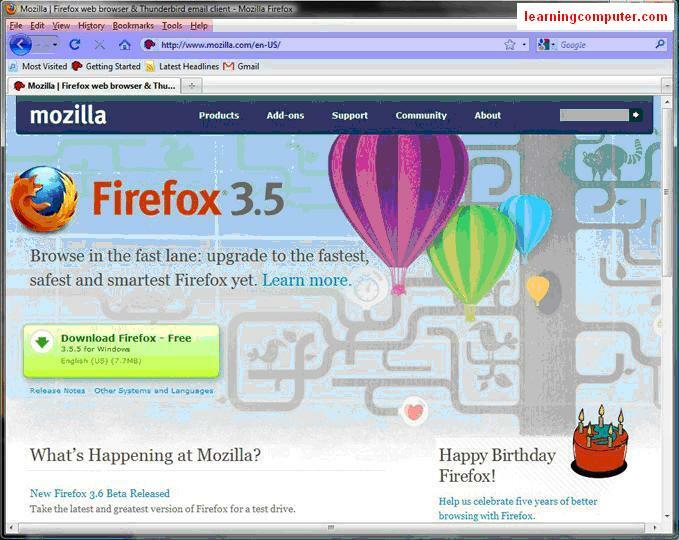 Firefox adds several new features and improvements over earlier versions. Support for new web technologies has been incorporated, including support for the newest web standards such as HTML5 and CSS3 as well as multimedia support for open source standards such as Open Ogg. Web application integration (think web-mail) has been improved and conveniences such as location-aware browsing (think GPS for your browser) have been made available to help you find the most relevant information possible when browsing. For those concerned with privacy, this feature is only used on certain web pages and your location is not shared by default; it is only shared with your permission. There is no need to worry if you aren’t familiar with these technologies. In the end, their addition is simply meant to make your browsing easier. Let’s start by taking a look at a few of Firefox’s most useful features, as it has many convenient features available to help make your browsing as simple as possible. Many options are built in or enabled by default, while others require a few extra steps to use. In either case, most features can be turned on or off without much effort, allowing you to customize Firefox to your liking. You can access the Options panel for customization through the Tools menu (Tools → Options …). See the Setup & Preferences section, for more details. Tabbed browsing is a great feature available to help users stay more organized when working with multiple web pages. Instead of having multiple browser windows open at once, inevitably cluttering your desktop, you can open additional pages as tabs (shown in red). To open a new web page or view a link in a tab, visit the File menu (File → New Tab) or right click a link and choose Open Link in New Tab. Tabbed browsing allows you to keep all open web pages together in one window, simply clicking on the name of the page (or tab) you wish to view. The active tab (tab displaying the current web page) will be highlighted for quick reference to your current location. What is Firefox Tip #1 : If you have a large number of web pages open and can’t see the full page name, clicking the arrow button on the far right of the tab bar (or far left, depending on your current theme) will display a list of all open tabs for you to choose. This is a quick and simple way to navigate tabs without having to resize the browser window. Like many web surfers, you may find yourself needing to step away from the computer for a while and wanting to pick up where you left off. If you don’t want to have Firefox save your session (the pages you were viewing when you quit Firefox) every time, or struggle to remember a word or phrase for the “Awesome Bar” to find, a nice alternate is to use the Session Restore feature. This feature is only available when you are closing multiple tabs or windows at once, but can be an extremely useful feature none the less. With multiple tabs or windows open, all you have to do is Exit Firefox (File → Exit) and you will be asked if you want Firefox to save your information for next time. If you change your mind, you can always quit without saving or Cancel and leave Firefox running if you choose. If you would like Firefox to handle exiting the same way every time, simply check the Do not ask next time box before picking an option and Firefox will store that preference for you. If you change your mind later, you can always reset the preference from the Options panel. Check the box for Warn me when closing multiple tabs from the Tabs section of the Options panel and Firefox will restore the prompt to its original setting (shown above). Additional preferences relating to tabs can be found in the Tabs section of the Options Panel. 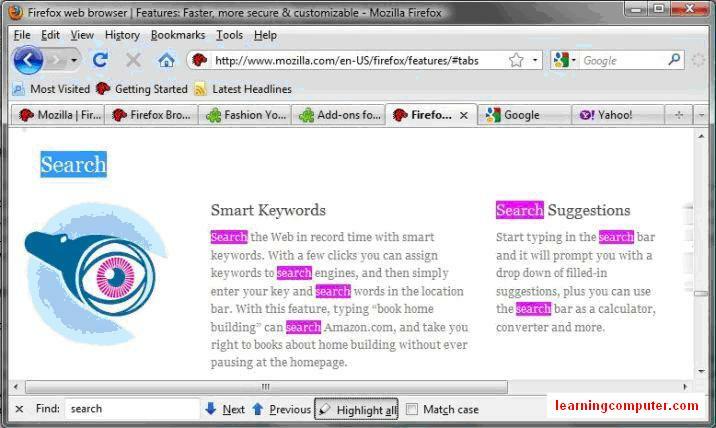 Web searches are performed on a regular basis by most every Firefox user, and the quick search field (shown in blue) provides instant searching directly from the toolbar. Click in the search field, type in your search, and hit enter or click the magnifying glass icon on the right of the field. The current window will then display your results. It’s that simple. 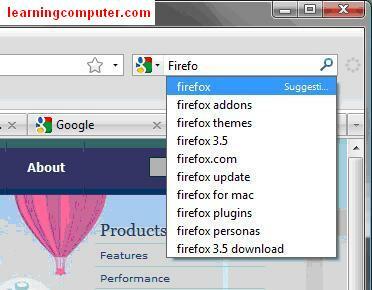 Firefox will even help you search by providing suggested searches as you type. While suggestions may not be available for every search engine, they are available for most and can prove extremely useful for finding the right search terms. To accept a suggested search, simply click on the search term in the drop down list and Firefox will display its results. It’s great that the quick search field is right at your fingertips, but its most powerful feature is that the search box is designed to work your way. Not only does it include the most popular search engines, but users can also access news and information sites, social sites, and even their favorite shopping sites (Amazon and Best Buy, for example). The quick search field isn’t just for Google and Yahoo anymore. Hundreds of search engines are available to choose from and users can switch between them with a few simple clicks. 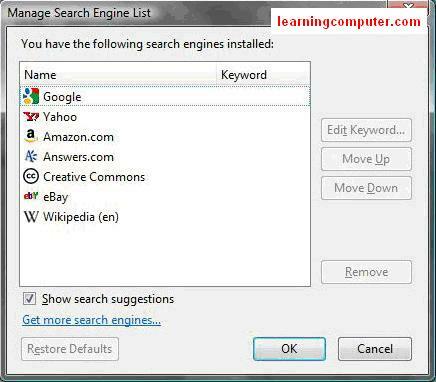 Clicking the icon on the left of the search field will display your most popular search engines and selecting one will activate it for your next search. The bottom link (Manage Search Engines) provides access to the search engines currently installed and provides a link below the list (Get more search engines…) to install additional ones. What is Firefox Tip #2 : The Move Up and Move Down buttons to the right of the list allow you to sort your search engines, listing your most popular choices at the top. This will ensure your top choices are always available with a single click. One new addition to Firefox that is often overlooked is its built-in spell checker. With web-mail, blogs, and on-line forms (just to name a few), Firefox checks your spelling as you go. There is no longer a need for special add-ons or extra steps. Misspelled words are highlighted (underlined in red, shown below) right in the browser. The spell checker works just like any standard word processor, allowing users to choose from a list of suggested spellings with a simple right click of the word. Spell checking is enabled by default, but if you would like to disable it, go to the Advanced section of the Options panel and un-check the box next to the Check my spelling as I type option in the General Tab. You may be new to Firefox, and maybe even the web. But with a little time, like many of today’s web surfers, you will eventually have a long list of on-line accounts and passwords to remember for your favorite sites. If you don’t have the memory of an elephant or don’t want to write down all of your passwords (good thinking), Firefox can remember them for you. Firefox’s Password Manager is enabled by default and will prompt you, at the top of the web page, to store a password when entering it for the first time. You can choose to remember it, never ask again for that site, or just ignore it for now. Once one of the first two options is chosen, the setting will be saved and you won’t be prompted again for that site. No additional setup is required. If you’re rather handle your passwords the old fashioned way, the feature is easily disabled by visiting the Security section of the Options panel and un-checking the Remember passwords for sites option. If you do choose to use the feature, a number of additional choices are available in the Options panel. More advanced users can manually manage their password list, choose or modify which sites to allow or exclude, and even encrypt their password list with a master password for added security. This option can be useful if others have access to your system; just don’t forget the master password. Without it, all of the stored passwords will remain encrypted and cannot be used, as Firefox requires the master password when starting to unlock the information. Firefox also provides forgetful users the ability to find that hard to remember site they’d like to return to by using a smart location bar (Mozilla’s self proclaimed “Awesome Bar” shown in red). By typing in part of a web address or title (even partial words will work), Firefox will search through your history and bookmarked pages to find potential matching sites and provide you with a list of suggestions. The longer you use Firefox, the better it will get at providing suggestions, remembering which sites you visited recently and learning which sites you visit most often. Information that the location bar has access to can be controlled or the feature can be disabled through the Privacy section of the Options panel. Available options can be found in the When using the location bar, suggest menu option. What is Firefox Tip # 3 : The “Awesome Bar” is a great way to find frequently visited sites in a hurry. If you are sharing a computer and are concerned with privacy, the features discussed in the next section will help protect your information; turning off the location bar setting will NOT, as all of your private data is still being stored. As mentioned above, Firefox keeps a history of your browsing. This can be useful for those forgetful web surfers like me. In addition, Firefox also provides a way to bookmark web pages (just like your favorite novel) so you can quickly and easily return later to view them again. Both of these features help make your browsing simpler by taking care of the details for you. You can access these features by visiting the History or Bookmarks menus. Or when trying to find lots of information, it may be easier to enable the Sidebar feature so you have information accessible at all times. To turn on the Sidebar, visit the View menu (View → Sidebar → Bookmarks or View → Sidebar → History). What is Firefox Tip #4 : Click the star on the right side of the location bar for an easy, one click method to create a bookmark. Bookmarked sites will be highlighted with a gold star. Even though keeping track of your visited pages may be a useful trick, there are times when you don’t want a trail of breadcrumb left for others to find. For those times, there is a simple way for users to clear their browsers saved history. You can clear out unwanted data by visiting the Tools menu (Tools → Clear Recent History…). From there, you can choose what types of information to remove and how much to remove. Choose the amount of information to remove from a few hours, to Today, or Everything in memory from the Time range to clearmenu option. The Details box (not shown by default – click the Details button to show) lets you choose what types of information to delete. What is Firefox Tip #5 : If you’ve gone to a web site you want to remove, but don’t want to delete hours or days of information, you can use the Forget this Site feature. From the History Sidebar or the History Library (History → Show All History), users can choose to remove individual sites by right clicking a web page and choosing Forget About This Site . All pages relevant to the chosen site will be removed from your browser’s saved history. There are lots of useful features in Firefox, but one of the greatest privacy features for shared computers might be Private Browsing. Want to find that perfect gift for Christmas without your significant other snooping? Want to keep your nosey roommate from reading your E-mails? No problem. Private browsing allows you to surf the web without leaving a trace. Information that would normally be saved for later use is only kept while you are using Private Browsing. Once you turn off the feature or exit Firefox, the information is deleted and safe from prying eyes. Users can activate or disable Private Browsing at any time through the Tools menu (Tools → Start Private Browsing or Tools → Stop Private Browsing). Once Private Browsing is turned on, any currently open web pages will be temporarily removed. Once the feature is turned off through the Tools menu, those web pages will be restored to normal and your private information is deleted. For increased security while web surfing, Firefox offers Anti-Malware and Anti-Phishing filters (“Malware” and “Phishing” are simply big words for dangerous things on the web). Firefox’s default security setting is to check every web page for harmful content before loading it and keep an up-to-date list (updated 48 times per day) of known fraudulent web sites. When harmful content is detected, Firefox will display a warning message and direct you away from the harmful site. This is an extremely useful security feature and novice users should not disable it under most circumstances. However, these features are not intended to be a substitute for virus protection, firewalls, or other types of security software for your computer. Two other features users may find helpful are the Download Manager and the Find feature . 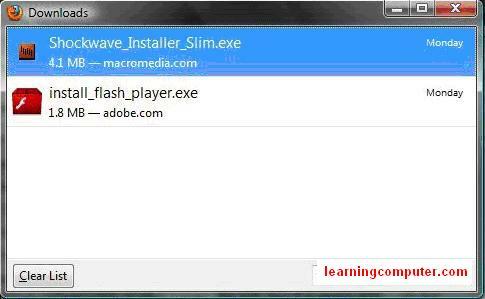 The Download Manager is available to help users keep track of their web downloads, monitor the download progress of those large downloads, and even allow users the ability to pause and resume downloads in progress. The Downloads Window opens by default when a web download is started, showing the current status of your active downloads and your download history. Users can clear their current list at any time with the Clear List button at the bottom, left of the window. Individual downloads can also be removed, opened, or even located on your system by right clicking the download. Similar to the built in Spell Checker, the Find feature works in much the same way a standard word processor does. It is used to search for words or phrases within the active web page. Users can enable the Find feature from the Edit menu (Edit → Find) or with the keyboard shortcut Ctrl+F(hold down the Ctrl key and F key simultaneously). Once enabled, a bar across the bottom of the Firefox window will appear, providing a search field, Next and Previous navigation buttons, and options. Many pages can be long and detailed, requiring users to scroll through numerous screens to view them entirely. The Find feature, however, will automatically navigate to the portion of the web page where the search term is initially displayed. If there is more than one occurrence, the find bar navigation buttons will allow you to quickly jump between occurrences. What is Firefox Tip #6 : To view multiple occurrences at one time, click the Highlight all button on the find bar and Firefox will highlight all occurrences (shown above). This provides a great visual cue for quickly locating multiple occurrences of a search term. 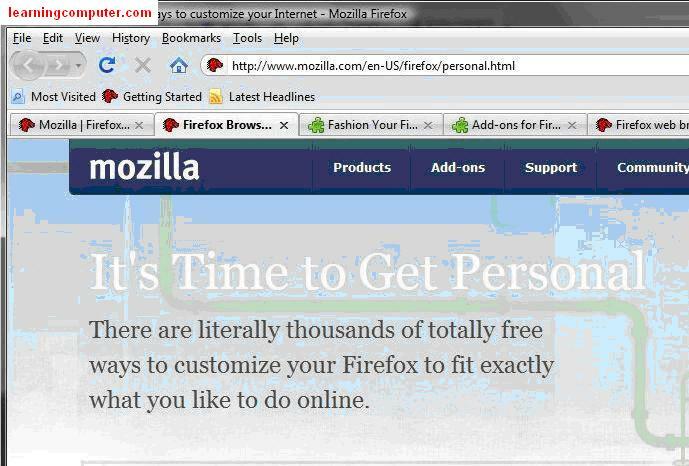 Firefox also offers several advanced GUI features for users wishing to add a more personal touch to their browser. Customizations may be difficult for novice users, although Firefox’s default settings can be restored if issues are encountered. 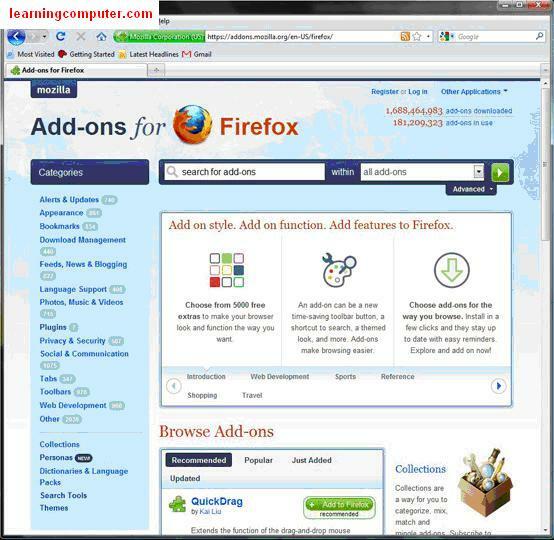 A big part of customization for Firefox is called Add-ons. Add-ons contain numerous categories, many of which should only be installed by advanced users. However, two particular add-ons are available that can help even novice users personalize the look and feel of their browser. 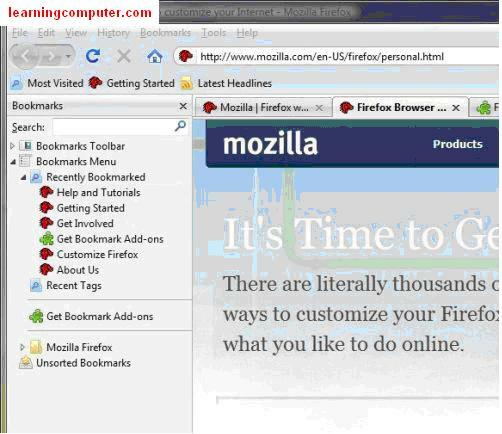 These include Personas and Themes, both of which change the appearance of the browser by installing custom images, buttons, or toolbars (all available through Mozilla’s Add-ons page, shown below, at https://addons.mozilla.org/en-US/firefox/). A persona is an add-on referred to as an “extension.” It is a new, and welcome, addition to Firefox’s list of customizations. A persona is a type of customization that uses backgrounds or wallpapers to change the appearance of the toolbars (shown below). They do not affect the toolbar navigation buttons and do not require users to restart their browser to take effect (unlike themes). While many themes and personas may work well together, it should be noted that some themes do not allow personas to work properly. If you notice an issue, installing a new theme or reverting to the default theme will generally correct the problem. Once the extension is installed via the Add-ons page, users can browse and quickly install personas through the Tools menu (Tools → Personas), or directly from the Add-ons page by clicking the Wear This button. Themes have been a staple of Firefox from the beginning and are also a great way to personalize the look and feel of your browser. The Default theme (highlighted below in the Add-ons panel) is the only theme installed by default, but a wide variety of additional themes can be installed through the Add-ons page. All installed add-ons, including themes, can be managed from the Add-ons panel. Users can open the Add-ons panel through the Tools menu (Tools → Add-ons). To view and install new themes, follow the Themes category link on the Add-ons page, click the theme of interest and click the Add to Firefox button. It should be noted that changing themes requires users to restart their browser before taking effect. Once restarted, the new theme will be displayed and any previously open web pages will be restored. Unlike Personas, themes can alter navigation buttons and even add new toolbars in addition to changing the browsers color scheme or background. An example theme (Vista-aero) is shown below, using custom navigation buttons, colors, and an added toolbar at the bottom, right corner. The last piece of customization is the toolbar (see the Getting Started section for details) and it can be customized to show only the items you wish to see. Right clicking the toolbar allows users to enable or disable the Navigation Toolbar (navigation buttons, location bar, and quick search bar) and the Bookmarks Toolbar (commonly used bookmarks shown below the navigation toolbar), as well as add additional customizations from the Customize Toolbar panel. Items, such as icons for frequently used features (print, for example) can be added or removed by dragging them to and from the toolbars when the Customize Toolbar panel is open. This may contain more advanced options, but can provide nice additions to make Firefox work the way you do. To open the Customize Toolbar panel, right click on any of the navigation buttons or above the location and quick search bars and choose the Customize… option. Now let’s take a look at the settings Firefox offers. Firefox provides a wide range of options, allowing users to customize everything from what to display when the program is started to privacy and security options and many more advanced functions. It does a good job of providing useful default settings and most of these options should not need to be modified. Many of these settings are also intended for advanced users and will only be summarized in this tutorial. Users can access the Options panel through the Tools menu (Tools → Options…). The panel consists of seven sections. They are displayed at the top of the Options panel and your current location within the panel will be highlighted as shown below. The Main section provides for control of Firefox’s startup behavior as well as the management of file downloads and Add-ons. 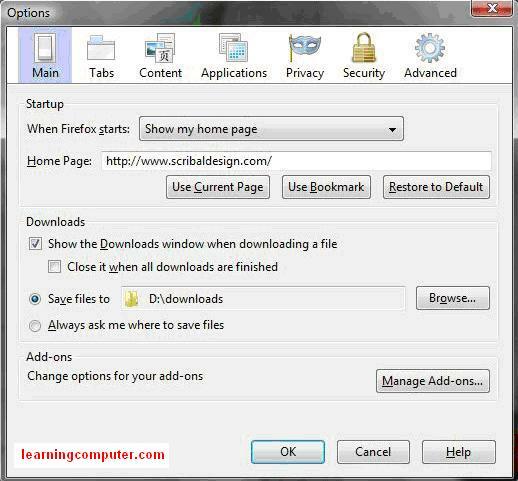 User can choose a custom Home Page (which web page to display when Firefox is started) and how Firefox handles downloads such as new programs, documents, etc. What is Firefox Tip #7 : Having Firefox return to the page(s) last viewed when restarting will let you pick up browsing right were you left off. Simply choose Show my windows and tabs from last time from the When Firefox startsmenu. The Tabs section controls the browser’s behavior when using tabs during browsing, a useful feature for organizing your web pages. See Keeping tabs on things in the Features section for details on using tabs. The Conten t section provides access control to web pages. This means you can choose which parts of a web page (such as scripts or pop-ups) are allowed to run when viewing the page. Enabling or disabling the Content features may affect your browsing experience, since legitimate web pages may use one or more of these advanced features. It should be noted, however, that malicious content may also utilize these features. The default settings provide a good balance between access and security and should be acceptable for most users. Most Content features allow for exceptions and advanced customization to help provide more choices, though these settings should be left to more advanced users. The Applications section controls the browser’s behavior when accessing different types of content, such as on-line video or music. Under most circumstances, Firefox will configure these settings appropriately and users should have no need to alter them. The Privacy section provides control over what data Firefox stores for the user as well as the expected behavior when using the location bar. If you are sharing a computer with others, changing the history settings and location bar settings can be helpful, though they provide a much better user experience if left enabled. 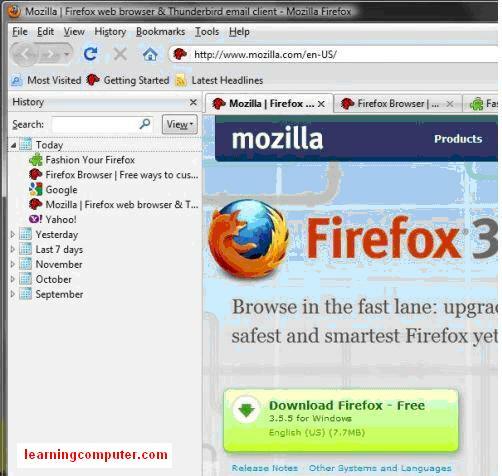 This section also provides users another method to delete the information Firefox stores and uses for several of its features. See Forgetful? and Covering your tracks… in the Features section for details on those features. The Security section provides options for protecting the user from malicious content, handling web site passwords, and choosing what types of warnings to be displayed. As with previous options, many security options allow for exceptions and advanced customization through a button to the right of the applicable option. As mentioned in the Features section, Firefox’s default security setting is to check every web page for harmful content before loading it, as well as displaying a warning message and directing you away from the harmful site. These features can be disabled by un-checking the Block reported attach sites and Block reported web forgeries options, though it’s not recommended. Novice users should avoid changing these settings without expert guidance. The Advanced section contains options for Accessibility, general browsing behavior, and how Firefox should handle keeping it and its add-ons up to date (automatic updating is enabled by default for your convenience). It also allows for creating custom network connections (common in business networks) and for managing data encryption commonly used for sites to send or receive private information, such as on-line banks and retailers. It is unlikely that your network or encryption settings will need to be changed, but if special settings are required for your setup, contact your network provider for the required details. For additional information, help, or other useful tips, visit Mozilla.com site.